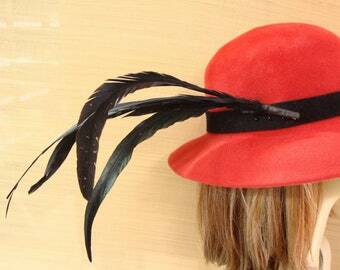 Announcement Kentucky Derby Hats need to be ordered by April 23 in order for you to receive them by May 2. Please message me if you have any questions. Top hats, women's felt hats, fascinators, women's straw hats, fedoras, mini hats, cocktail hats. I hand block them in straw or felt. THESE ARE NOT HATS I BUY AND DECORATE. I design and personally create all of my hats! I hand dye and shape each hat and they are all made one at a time and many are one of a kind. The travel hat is my specialty...for it I have designed a fine sinamay soft draped band. . If you don't see what you want I will gladly make one just for you in your size, color and shape! It's not just a hat...it's your beautiful hat. Kentucky Derby Hats need to be ordered by April 23 in order for you to receive them by May 2. Please message me if you have any questions. The hat is beautiful, but the sweatband is about 2" too high into the hat, so the rough straw irritates my skin on my forehead, as my forehead does not even touch the sweatband. The overall construction of the hat is not what I had expected. The hat is a bit taller than the 5.5" description, and the brim a bit smaller than listed due to the brim going up into the hat itself and there not being a line of demarcation between the actual brim and the hat (the brim was not put on after the fact as with common hats, so it is very difficult to shape the brim, it is set) the sweatband is way too high. Overall? I probably will not be wearing it due to the irritation that I have on my skin that forces me to take it off. Definitely 'homemade', not professional in my opinion. The seller is very nice, but the product, I am not happy with. The picture does not do this hat justice. I don’t think I’ve ever worn such a gorgeous hat. It’s so carefully boxed and covered in tissue with such care. Even comes with instructions. I will cherish this hat. I’ve got a weird shaped head and this hat fits like a dream. Thanks so much! Delivered on time too. I can’t wait to wear this to a Steampunk Mystery dinner and then a Downton Abbey Tea. It’s going to top off my Lady Mary inspired Riding Habit. It's all about the hats!!! I design and create all of my hats. 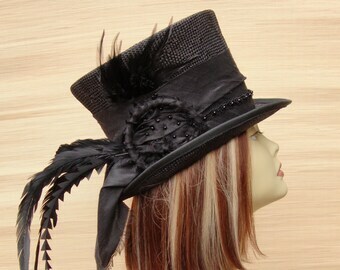 Top hats, women's felt hats, fascinators, women's straw hats, fedoras, mini hats, cocktail hats. 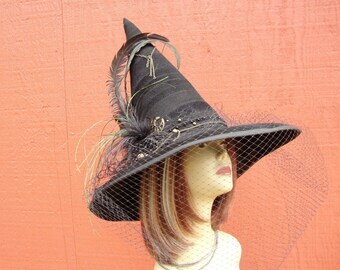 I hand dye and shape each hat and they are all made one at a time and many are one of a kind. Through the years I have made many, many hundreds? Thousands? of hats. Thousands of people own my hats. I have made hats for work, weddings, funerals, college, proms, night out on the town, the derby, traveling, mardi gras, sun rain, and snow. I have sold at fine art fairs for many years, wedding expos, I even went to a clown convention once. That was funny!! The innovation in my designs comes from being self taught and thru many hours of experimentation. Some of the techniques I use I have developed myself. While I love the "sculptural opportunities" millinery offers...but prefer to say they are softly draped or free formed allowing me to create simple or complex designs. I source most of my materials, preferring to support small businesses both global and local to purchase my supplies. All of my materials are natural and contain no sizing or chemicals. if a stiffener is needed I use nontoxic. I ship to the address provided by Etsy. Please make sure your Etsy Checkout Address is the address you want your order shipped to. You will receive notice when your purchase has shipped. I am not responsible for damage or loss of packages once they are in the postal services hands. Other shipping services as well as expediated shipping are available on request. Please ask before purchasing. Customer is responsible for any taxes, duties or any point of entry charges. 1). Millinery is made individually for just you in your style and size. 2). Hygienic reasons. You can be confident that your new hat has never been worn by anyone else. I work very hard to make sure my hats are well made with quality materials. If you are unhappy with your hat, please, let me know immediately. I will certainly do everything I can to make it right and you happy! My designs are made to wear and enjoy, but some components of a hat may be delicate, so please take good care once it arrives in your home. I offer no guarantees for wear or durability under any circumstances other than normal wear. I make each of my hats one at a time...special...for you. Hand manipulation of felt can produce different outcomes . This add character and individuality. Some embellishments are one of a kind. Therefore, made to order hats may have slight variations in style and embellishments. But rest assured...yours will be just as beautiful, if not more so. I enjoy receiving feedback and pictures! Thank you so much. Welcome to OlyHatWorks. Thanks for stopping in. Customer satisfaction is most important. I am always willing to answer any questions and encourage you to ask questions before you purchase. I work in a smoke free and pet free studio. ****How to measure you head: To measure your head.... wrap a soft tape measure around your head across the forehead and over the bump in the back. A half an inch above your ears. Wrap it as tight as you would like your hat. This is your hat size and how you hat will fit. Measure carefully.....three times to be sure! 1). Millinery is made individually when ordered just for you in your style and size. Pay directly with Visa, Mastercard, American Express Discover and Etsy Gift Cards. PAYPAL: Use you account or pay by using your credit card or bank debit card, with a Visa or MC logo. Here is a link with step-by-step direction should you have any questions about the checkout process. I charge sales tax to all orders with addresses in Washington State. You will be sent notice when your purchase has shipped. I ship via U.S Postal service. First class and priority mail. You will receive a tracking number and Insurance. Packages are not considered lost for 30 days past ship date (as per USPS regs) and that the customer must fill out an affidavit for insurance purposes in case of loss or damage and supply photos in case of damage.